The SMTP Authentication dialog is available in Mailtraq for any field against which is displayed a padlock icon , principally in the Outgoing Mail dialog at the Remote Mail Server and the Static Routing Table tabs, both of which appear within the Outbox Properties dialog. This dialog can also be reached via the Outbound SMTP Security dialog. SMTP client authentication enables Mailtraq to exchange credentials with remote mail servers. Authentication is performed before attempting to send mail because it may be required in order to permit either access or authorised mail relaying or both. To ensure compatibility with the requirements of remote mail servers, Mailtraq may be configured to provide custom hello strings. 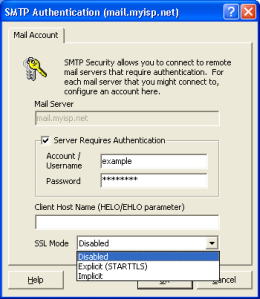 The Mail Account tab appears on the SMTP Authentication dialog and must be configured if the specified remote mail server requires SMTP authentication. This field contains the non-editable host name of the remote mail server (set in the previous dialog) to which the following authentication parameters apply. The account name or username relevant to the remote service which is being accessed. The password relevant to the remote service which is being accessed. The string specified here is be used in by Mailtraq to identify itself to the remote mail server prior to authentication (if the remote mail server requires). In most cases, the default Domain Name can be used but some services may require a specific EHLO identification string to be used. Mailtraq supports both Implicit and Explicit (STARTTLS) SSL/TLS modes. To demonstrate SMTP authentication two systems are required, one acting as the server (listening for connections) and one acting as the client (initiating connections). The client connects to the server and the connection is authenticated by the two parties exchanging encrypted strings which are based on a shared secret, i.e. a password, which is never transmitted as plain text to avoid it becoming compromised. What follows details the settings and processes involved in SMTP AUTH transactions from the separate perspectives of the server and client systems and shows the logs produced by both parties. On the server, an instance of the SMTP Service must be running on an interface which is accessible to the connecting client. For this example, that is port 25 on server.jhc which host resolves to 192.168.55. On the Relaying tab of the appropriate SMTP Service instance, the option to 'Use SMTP User Authentication' must be enabled. Within User Manager, a user must exist with a username and password which is known only to the connecting client. On the Privileges tab of the User Properties dialog, the option to 'Relay Mail beyond this server' must be enabled for that user. The defined user on the server for this example is 'laptop' with a password of 'abcd' (both without the quotes). Note that the string in the Client Server Name field for this example is pure invention to more easily distinguish its presence in the SMTP protocol exchanges. s: 354 send the message, terminate with "." Note that the Mailtraq client instance defaults to requesting the most secure authentication method available from the server instance, in this case CRAM-MD5. SMTP authentication is detailed in RFC 2554.